3- the tropical climate of the savanna in the south, where the rainy season is a bit longer (May and October) and more intense, and rainfall exceeds 600 mm (23.5 in). The vast northern area (zone 1 on the map), virtually lacking settlements except for a few rare oases, is occupied by the desert, and has an average temperature in January between 15 °C and 20 °C (59 °F and 68 °F), with some cold nights in the winter months (the cold records are around freezing), while summer is scorchingly hot. In the extreme north-west, the climate is typical of the Sahara desert, and July is the hottest month. It almost never rains, although some cloud banks can affect this area in summer, when very few downpours can occur. Here are the average temperatures of Taoudenni. More to the south, in July and August, the temperature decreases slightly because this area can be more often affected by a bit of cloudiness and some rare showers. Here are the average temperatures of the northern city of Tessalit, located in the north-east and at 500 meters (1,600 feet) above sea level. The cloudiness and the rare showers in the summer period are caused by the extreme offshoots of the African summer monsoon, which brings humid currents from the Atlantic Ocean, but they are not felt much up here. Here is the average precipitation in Tessalit. The sun in Tessalit shines all year round, but in summer, the hours of sunshine do not increase, or decrease slightly, even though the days are a bit longer. Here are the average sunshine hours per day. In the central area (zone 2), the climate is tropical, since the average temperature in January is equal to or higher than 20 °C (68 °F). Here, the hottest months are April, May, and June, when the maximum temperature normally exceeds 40 °C (104 °F), but with peaks of 47/48 °C (117/118 °F), while later, when the monsoon comes, it is able to lower the temperature by a few degrees, and to bring some downpours, more intense and frequent than in the northern area. This area, which is stretched from west to east, south of the Sahara, is called Sahel. 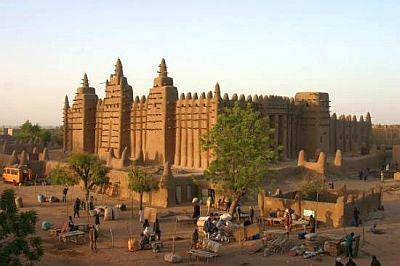 In Timbuktu (or Tombouctou), the legendary city of the past Mali Empire, 180 mm (7 in) of rain fall per year, almost all occurring from June to September, with a maximum of 75 mm (3 in) in August. Here is the average precipitation. After the rainy season, which here is still characterized by high temperatures, around 35/36 °C (95/97 °F), the heat increases slightly again between September and October, to around 37/38 °C (99/100 °F), but with peaks above 45 °C (113 °F). In the winter months, the maximum temperatures decrease, and hover between 27 °C and 30 °C (81 °F and 86 °F). Winter is the only period of the year when the heat is not scorching; the sky is usually clear, even though the wind from the north-east often blows, the Harmattan, which raises dust and sand, making the sky appear whitish. The source of water that made it possible for a city like Timbuktu to flourish over the past centuries were certainly not the few summer rains, but it was rather the Niger River, whose headwaters are located in the mountains of Guinea, and which flows in this semi-desert area, then bends and returns to the south. Here are the average temperatures in Timbuktu. In Timbuktu, the sun shines all year round; however, the hours of sunshine diminish slightly in summer. Continuing south, the summer rains become more abundant. Already in Mopti, in the area of the "Inner Niger Delta", the rainfall amounts to 500 mm (20 in) per year. In the southern area (zone 3), rainfall exceeds 600 mm (23.5 in) per year, and in the extreme south, it exceeds as many as 1,000 mm (40 in). In the capital, Bamako, annual precipitation reaches 1,000 mm (40 in), and the rainy season is a little longer, with the first pre-monsoon showers already in May, a maximum of 300 mm (12 in) in August, and the last rains in early October. Here is the average precipitation. In the southern area, the summer temperature is lower because of rainfall and cloud cover, in fact, highs hover around 30/32 °C (86/90 °F), while in winter, the southern sun raises the daytime temperature to around 33 °C (91 °F), even though the air is dry and nights are quite cool. In Bamako, the hottest month is April, with highs around 40 °C (104 °F), while owing to the first thunderstorms, the temperature drops a bit already in May. In summer, the sunshine hours in Bamako diminish more than in the central areas, and August is the least sunny month. The best time to visit Mali is winter, from December to February. By February, the heat increases and it starts to get hot in the south, while in January, sandstorms raised by the Harmattan begin to be more frequent in the north-central, so the best month overall is December. However, in this season, nights can be cold in the north, where the temperature may drop near freezing, while in Bamako and in the south, it can get to around 8/10 °C (46/50 °F). In winter: bring light clothes for the day, long and made of natural fabric (cotton or linen), a desert turban for the wind-borne sand and dust, sunglasses (even graduated instead of contact lenses), a jacket and a sweater for the evening, desert boots or sandals, and a sweatshirt or sweater for boat trips on the Niger River. In summer: for the desert, bring lightweight clothes, of natural fabric (cotton or linen), a desert turban; a sweater for the night, and a sleeping bag to sleep outdoors. For Bamako and the south, light clothes, an umbrella or a light raincoat, and possibly a sweatshirt for the rain showers.